The Gowanus Lounge: Want to Buy a Used Astrotower ? Astroland Rides Up for Sale!!! Want to Buy a Used Astrotower ? Astroland Rides Up for Sale!!! If you had any doubt that Astroland is toast at the end of the season, look here. We don't know about talk of keeping it open for another season or of it reopening elsewhere. What we do know is that almost all of its rides are now up for sale and that they've been listed with a company called Ital International that sells amusement park rides. They are listed as "available" as of Labor Day. There is a lengthy discussion of the Astroland Sell Off on the Coney Island Message Board. The Water Flume, manufactured in 1965 and said to be in "excellent condition" will set you back $199,000. The Tilt-A-Whirl, on the other hand, is only $29,000, as is the Scrambler. 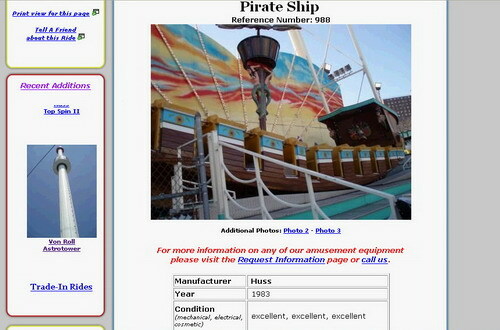 The Pirate Ship, though, is $199,000. Dante's Inferno is $225,000. No price is listed for the Astrotower. For that, you have to call.